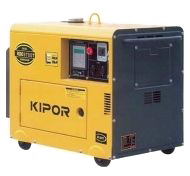 We can supply a 5kVA diesel generator for outdoor events. This will provide enough power for a small PA System with stage or effects lighting, or a larger (up to 4kW) system with monitors but without lights. This will cost £100.00 + VAT (£120.00 including VAT) per day - including delivery and fuel - when hired with any of our packaged systems.